We have again had a hard winter, with temperatures reaching a record low in mid December, harsh weather for so early in the season. Once the snow had eventually cleared the garden beds looked very sorry for themselves with soggy leaves and debris pushed flat against the soil. 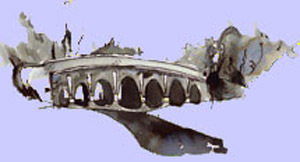 It did not seem that anything would ever be able to show its head above ground. However, January has been much milder and I have been able to spend a sunny morning outside clearing the way for the early bulbs to show through. By mid January it was quite a surprise just how much was beginning to grow. After such a harsh start to winter I was expecting to have to wait longer than usual for the first bulbs to appear, but by mid January exactly on cue the first bulbs to flower, as always, were snowdrops. These have been quickly followed by the first tips of crocuses and daffodils to appear above ground. Primroses, however, have been a little slower and now, in late January, there are only one or two tentatively beginning to bloom. I am trying to establish a clump of winter aconites for an early show of yellow before crocuses appear. They are now starting to come through with their stems arching up to keep their heads underground until the last minute. A few years ago I planted a winter flowering honeysuckle which has been quite slow to establish. However, over the last year its growth has improved and there are now lots of flower buds waiting to open. I look forward to enjoying their perfume. Flowering on winter jasmine is now at its height and is making up for last year’s disappointing show. In the front garden the first bulbs are usually followed by a carpet of pulmonaria flowers in shades of pink, purple and blue with a sprinkling of white making a cheerful contrast to yellow and cream crocuses. However, they suffered very badly in the almost forgotten prolonged hot, dry spell in June and July last summer so I am not expecting there to be as colourful a show this year. Amongst other early flowers to put in an appearance in the back garden is that of comfrey, I have a variety which starts off with flowers of deep red fading to pink then almost white. Comfrey forms dense clumps which look very untidy after winter snow and rain, but the flowers are a welcome sight and when cleared away the winter debris is a boost to the compost heap. It spreads quickly but is easily tamed and I use the leaves directly in trenches in the vegetable patch if there has not been time for them to compost down. As spring approaches and the early bulbs fade, daffodils begin to dominate the show and other flowers appear. 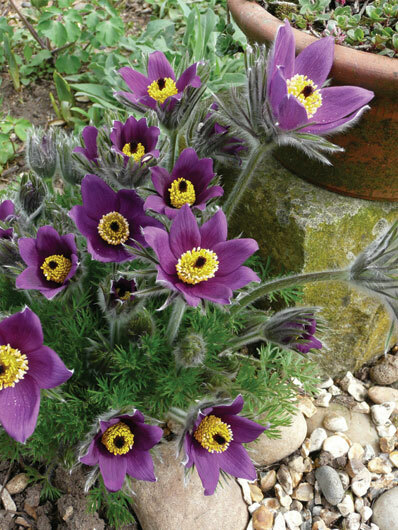 An early favourite is pulsatilla or pasque flower, so called because it flowers around Easter time. I have several clumps mostly of the common purple variety, but also of a white strain and a slower to establish deep red. These liven up the front of the border and are followed by silky tassel-like seed heads, prolonging their season of interest. By then there will be many more flowers appearing to fill out the garden borders, honesty, tulips, aubrietia, cowslips all putting on a show. Then there will be oriental poppies, bearded irises, helianthemums, osteospermums all building up to a glorious height in midsummer..